Murder by Gaslight: A Romantic Story. A man accused of murder proved innocent after death. Some workmen, digging holes for the posts of a fence, in Unionville, Westchester Co., a fortnight ago, unearthed the skeleton of a man, evidently long buried. From the position of the bones, the skill resting between the knees, it was surmised that the unknown deceased had not received the customary burial, and that murder had been committed. 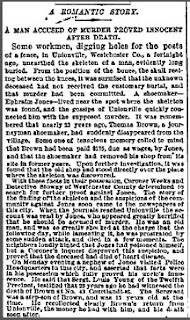 A shoemaker—Ephraim Jones—lived near the spot where the skeleton was found, and the gossips of Unionville quickly connected him with the supposed murder. It was remembered that nearly 23 years ago, Thomas Brown, a journeyman shoemaker, had suddenly disappeared from the village. Some one of tenacious memory called to mind that Brown had been paid $175, due as wages, by Jones, and that the shoemaker had removed his shop from its site in former years. Upon further investigation, it was found that the old shop stood directly over the place where the skeleton was discovered. With these facts in their possession, Coroner Weeks and Detective Stoway of Westchester County determined to search for further proof against Jones. 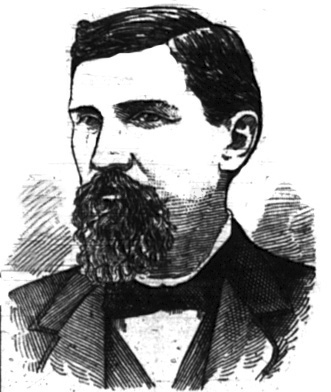 The story of the finding of the skeleton and the suspicions of the community against Jones soon came to the newspapers of this city. When the journals reached Unionville the account was read by Jones, who appeared greatly horrified that he should be accused of murder. He was an old man, and was so greatly shocked at the charge that the following day, while lamenting it, he was prostrated by some sudden attack, and died in a few moments. The neighbors loudly hinted that Jones has poisoned himself, but a Coroner’s inquest disproved this suspicion, and proved that the deceased died of heart disease. On Monday evening a nephew of Jones visited Police Headquarter in this city, and asserted that facts were in his possession which fully proved his uncle’s innocence. He said that Sergt. Louis Young of the Twelfth Precinct, testified that 23 years ago he had witnessed the death of Brown at No. 43 Courtlandt St. The Sergeant was a step-son of Brown, and was 12 years old at the time. He recollected clearly Brown’s return from Unionville, the money he had with him, and his death soon after.